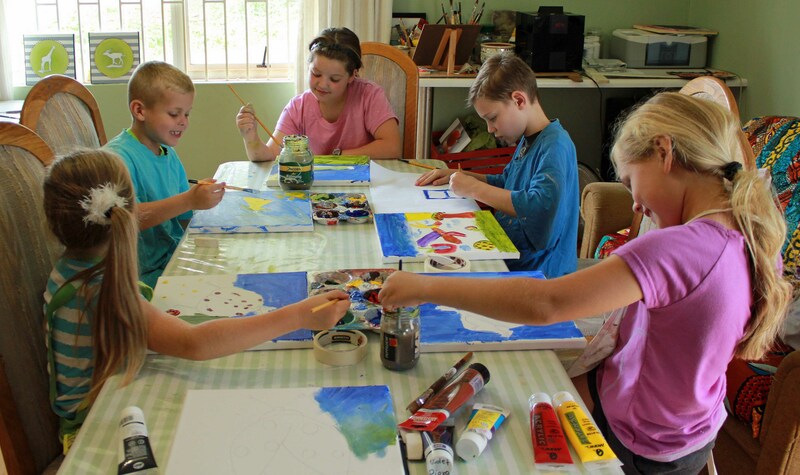 During the first week of the December school holiday, I had the privilege to host 5 Grade 1-3 students in an art clinic. It’s always a wonderful experience to work with young excited artists. They are full of life and ready to accept any challenge you bring before them never even considering the chance of failure. The clinic was presented over three days. Day one focused on basic drawing skills, teaching them to recognize the basic shapes in pictures and how it can help them to get to their final image. Our theme for the day was all kinds of bugs and butterflies. 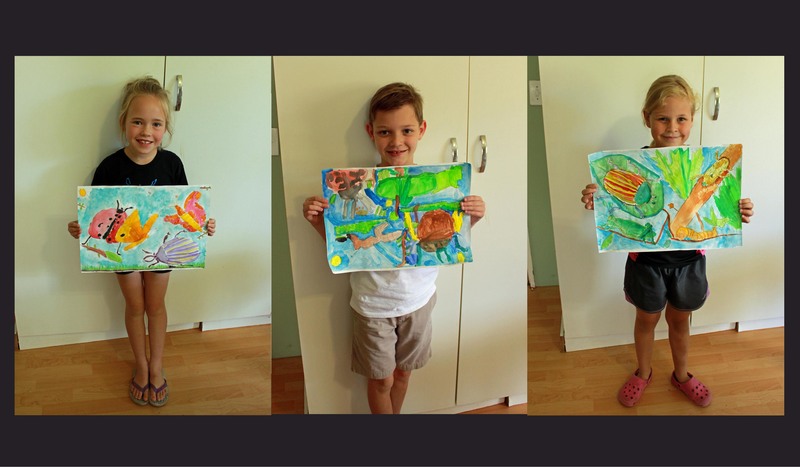 The second day we took our favorite bug drawings and did a water colour and mixed media study. After which we attempted our favorite bug on a canvas with acrylic paint. Day three was the sculpture day. We made slippery frogs from paper mâché. On day one we were immensely blessed with rain, and then some more rain. But the rainy weather did not dampen or dilute the enthusiasm of the students. It’s interesting how easily they get the drawings done. We started our day with some relaxation exercises and warm-up drawings. We looked at the different basic shapes we can hope to find in pictures. The first attempt of drawing with shapes was a puppy. And what a variety of puppies we had! The next step is not for the faint at heart, we faced our fears and we had drawings of wasps, spiders, beetles and butterflies, to name but a few. On the second day the students traced their bug drawings of the previous day on an A3 Fabriano sheet. After drawing in our images the students drew in leaves, sticks and stones and anywhere you would think to find a bug. With a short tutorial and a little help along the way they jumped right into painting a wonderful wonderland of colourful critters. The chosen medium was water colour and we started with a wet on wet technique in the sky area. From there we moved on to the grass and leaves. Different greens, yellows and blues were used to create diverse and interesting foliage. One by one the insects started to take shape, different light and dark colours were used to show the shaded areas and highlights. Day three was a learning experience (especially for me) when we started to build our frogs. At first our paper mâché mixture was to sticky, then it did not want to dry. We had frogs in all shapes and sizes and it’s a pity we did not get to paint them. Next time the sculpture day will move to day 1 to ensure we get to finish our sculptures. I was amazed by the results of the students. Their works were honest, creative and interesting, and approached without fear of failure. 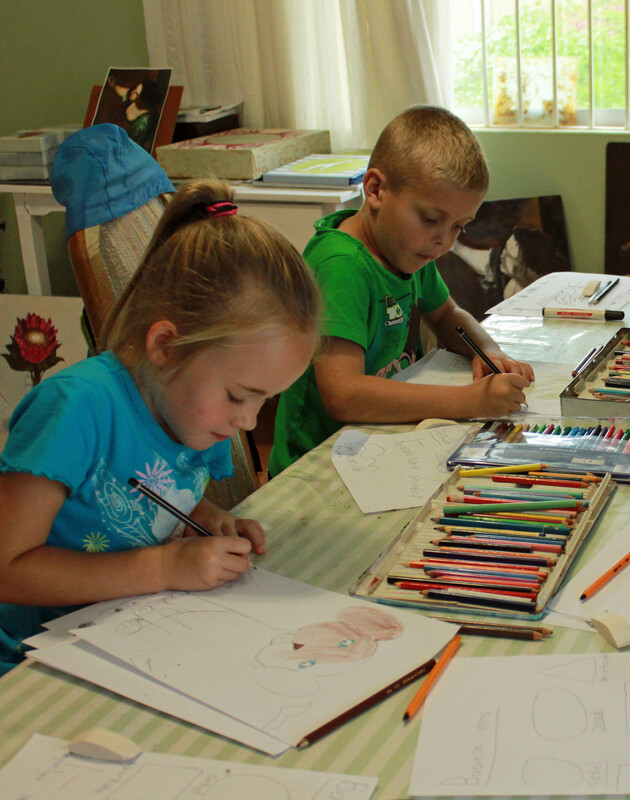 In future there will be two separate art clinics for Grade 1-3 and another for Grade 4-7. 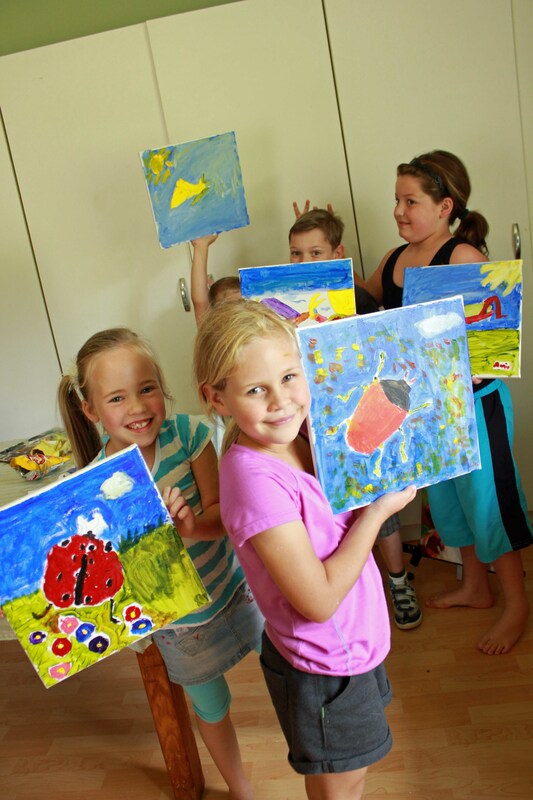 Anyone interested in the art clinics can contact Christelle via the CONTACT page on this website. Please specify that it is in connection with the art clinic as well as the grade your child is in.